… since I’m now a blogger with 200+ posts, but, yeah. Profound is not so much “me”. Silly, yes. Full of ridiculously bad jokes, absolutely. But profound, nah. Mountain Colors Bearfoot in “Steelhead” on the left, and “Juniper” on the right. Both great colors, and I think Jenneke will like them, but I wasn’t sure from looking online which she would like better. So… I got both. And since I like them both, I’ll happily add whichever she doesn’t choose to the, um, kind of large (although not as large as some people’s) sock yarn stash. So, Jenneke, what do you think? Steelhead, which has some bits of nice sagey green mixed with blues and greys, or Juniper, which is more aggresively green with dashes of blue and purple? The next question of course – which pattern do I make? Off to think about that! And Jenneke has spoken – the Juniper is hers! 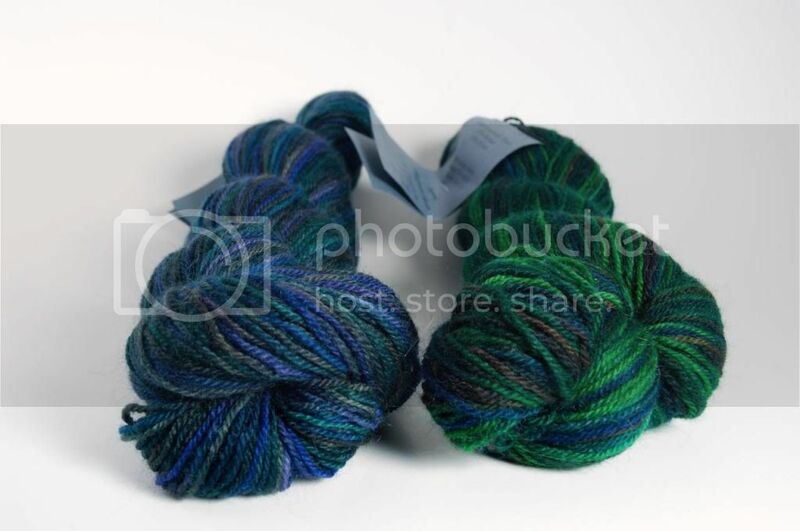 January 20th, 2007 | Tags: Knitting, RAKs and SP Stuff, Yarn Acquisitions | Category: Misc. Frickin gorgeous colors!! You picked two hard colors to choose from. Good luck Jenneke! Hey, are you insulting my stash? I love the yarn, so pretty! Heh – now you guys see why I couldn’t make the decision myself! WOW!! Both AWESOME colors! The Juniper has so much depth to it! And I LOVE Bearfoot….my last two pair of socks have both been made of it…in fact, I’m wearing one now! Comfy, warm, and soft…Lucky girl! I am such a lucky girl! Pfew, it’s a close call. They are both very pretty and in the right color family. I think I’m going for the right hank – great picture btw! greatings from Holland, yet another storm tonight. They’re both gorgeous! If she can’t make up her mind, you could knit one sock in one, the other in the other… then do the same for yourself and make sure your sock pal and you have embarrassingly matching twin socks! Yeah! They are both beautiful! Your swap pal is lucky!